Anthony Kinsey (@AKinseyMSFT) from the Windows Insider team here, and I’d like to share some details with you today, on how we’re addressing the great feedback that Insiders provided to us during the Bug Bash last April. In case you missed it, we published a summary of Insiders’ participation in the April Bug Bash a few weeks ago, which detailed areas like how much Quest and global coverage Insiders provided, as well as the total amount of feedback received during the Bug Bash. In this summary, we’ll be following up to show what we’re doing with all the feedback that Windows Insiders provided during the Bug Bash, and also highlighting a few examples of key issues that Insiders helped us identify during the Bug Bash that are now fixed. What happens to Bug Bash feedback? As feedback from Insiders comes in during the Bug Bash, our “WDG Community Champions” (members of the Engineering teams who have signed up to help their team listen and respond to feedback from customers) are reading the feedback, helping their teams understand the impact of each issue, and then prioritizing feedback to be fixed by linking it to code bugs, or other work items used by the development team, which are then tracked and implemented by developers within the team. 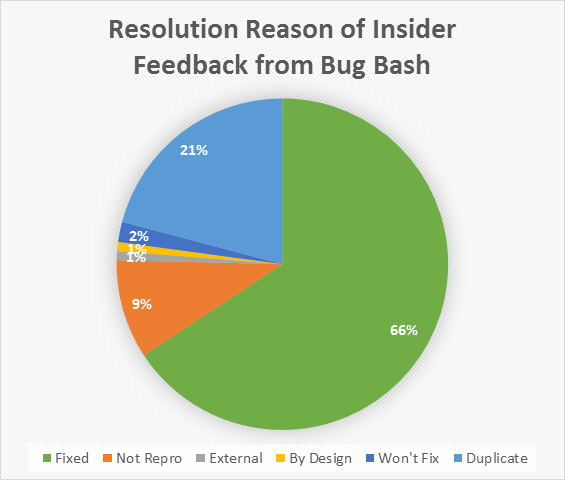 As we mentioned in the previous summary, Insiders provided over 375,000 pieces of feedback during the last Bug Bash. Our champions took that feedback and, so far, have identified over 500 unique bugs that are targeted to be fixed for the Windows 10 Anniversary Update – this number may seem a lot smaller than the 375,000 initial pieces of feedback, but right now we are laser-focused on fixing only the most severe issues and putting the final touches on the Anniversary Update, so the criteria for feedback to get fixed is currently very high. After the Anniversary Update is released, we’ll continue to look at addressing feedback that didn’t make the bar the first time around, and a new set of bugs will be created that we’ll look to fix for future Insider Preview builds. Out of the 500+ high-severity bugs that have been created so far from the Bug Bash feedback, 66% of those bugs have already been fixed. We actually consider this to be a very high percentage fix rate for bugs this late in the development cycle, so this shows that Windows Insider feedback is heavily contributing to making the Anniversary Update into as high quality a release as possible. Once again, we thank you all very much for spending the time to help us Bug Bash, and for helping us identify the highest priority issues to be fixed for the Windows 10 Anniversary Update. We heard from many Windows Insiders that this was a fun activity for them and they would like to do it again, so we will definitely be looking at ways to include Insiders in these activities moving forward. If you have feedback on the Bug Bash, or ideas on how to improve, please leave us some feedback in the Windows Insider category of the Feedback Hub app.